I had a bunch of coconut beverages in my fridge. It was time for them to go. There are a million and one bircher muesli ‘recipes’. I’m not looking to tell you that this one is better. Just that as it becomes an increasingly popular breakfast (lunch, or dinner?) choice, outside the realms of the Swiss or German, it is the easiest thing to whip up from fridge and pantry finds. No planning needed. Rolled grains, dried fruits, toasted nuts, milks and yoghurts. Toss them together (not in the bin), no order, no recipe. Leave them in a jar overnight. And what do you know, you’ve got an £7 brunch dish sitting pretty on your breakfast counter. Better, yet, flavour it how you want, with what you want. You don’t always have to play by the rules. Note: generally I prefer to make a bircher with half liquid (milk of some kind) half yoghurt for a thicker/creamier result. However, with all the coconut beverages to use… I added in a little Chia to thicken instead. Perfectly light and refreshing for hot (late…) summer mornings. This recipe isn’t perfect but each and every ingredient is substitutable. You can make ahead meals, eat balanced breakfasts, use up leftovers. To be honest there’s really nothing bircher muesli can’t do. nibs etc. original recipe. Serves 5-6. 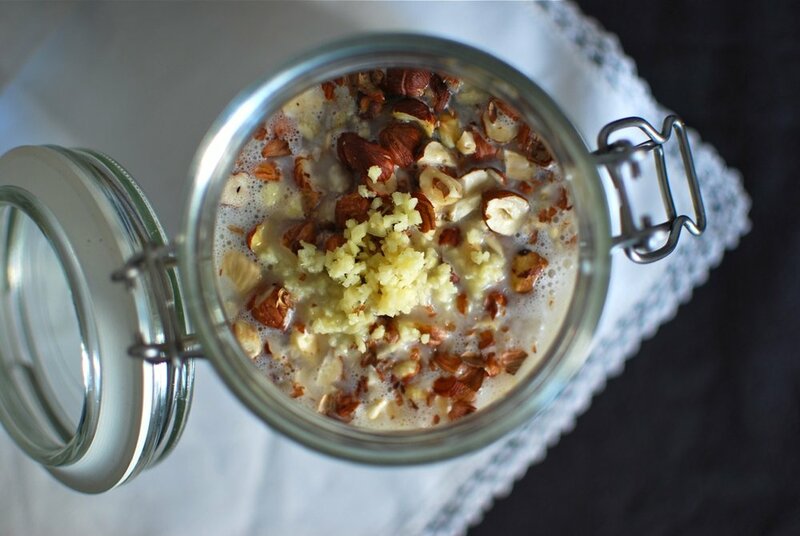 Into a jar pour your oats, coconut and chia. Toast your hazelnuts in a pan for 2-3 minutes until they start to golden and smell nutty. Then roughly chop, along with your pitted dates. Add to your dry ingredients. Pour in the wet ingredients, and mix together with a fork. Finally, add the minced ginger – adding after the liquid allows it to be more easily distributed through the dry mix. Refridgerate overnight. Serve ½ cup of muesli with 3 heaped tbsp of thick plain, Greek , or coconut yoghurt, and mix in half a mashed banana. Top with the other half of your banana and any seasonal fruit on hand. Topped with nut butters, rippled with jams, sprinkled with toasted coconut and or pumpkin and sunflower seeds. Substitute the apple for the equivalent in fresh, chopped pineapple, for a little virgin colada twist. Go substitute mad: oats for spelt, flax, or mixed; coconut milk for nut, regular, soya milks; dates for dried apricots, cranberries, prunes, goji berries; hazelnuts for walnut, pecan, cashew, almond.